“I don’t consider myself a disabled person; I am just a person walking in crutches. That’s the way I am, and it is not going to change, but I am not different. Perhaps, through my example, I can help other people to evolve and learn to never give up. That’s what I think about this day: as an opportunity to show someone something they have not thought about yet.” says Demy Papathanassiou, Dance student at the Frances Rich School of Fine and Performing Arts, on the occasion of the International Day of Persons with Disabilities, on Sunday, December 3. Demy was interviewed in ελculture.gr in relation to the Onassis Cultural Center’s (OCC) special event held on Sunday, called idance, on the access of individuals with disabilities to culture, an event which she was part of. 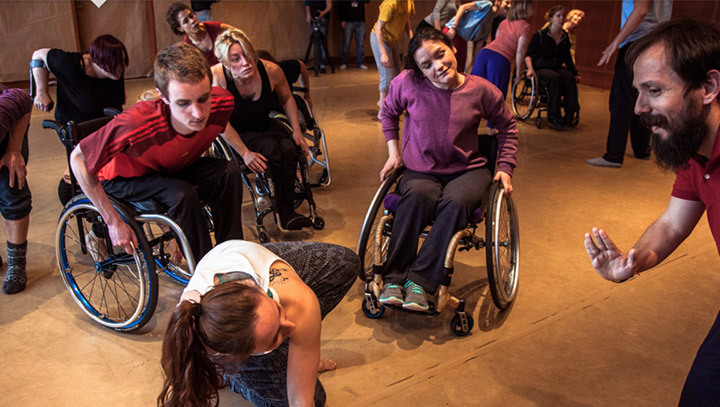 Demy is the first person with disabilities to have been accepted for a BA in Dance at Deree, and describes her experience as a life-changing one! She also spoke about the positive support she has received from the Dance faculty and her fellow-students to pursue her chosen career. What’s more, last weekend, one of our Level 6 students Konstantinos Anastasiadis was selected to present his choreographic work –developed within the BA modules– at the Dancehouse Lefkosia Dance Gate, Cyprus, NO_BODY/ MOVING ON Festival. And all this in only the second year of the Deree Contemporary Dance Practice program! Congratulations Demy and Konstantinos, we are proud of your remarkable achievements and are wishing you the best of luck in your next steps!